NY: American Universities Field Staff. Very Good+ in Very Good+ dust jacket. 1972. First Edition; First Printing. Hardcover. 0910116865 . 79 pages; Very Good Plus/Very Good Plus. Outside page edges lightly age tanned. Boards are straight, tips are pointed, spine is square and pages are clean. DJ back panel lightly rubbed (one book against another). One closed tear at top edge and one chip top edge of front panel. Now in protective sleeve. The World's Energy Crisis and the Persian Gulf. .
DC: National Planning Association. Fine. 1992. First Printing. Stapled Wraps. 16 pages; Fine condition. No creases. Solid, clean. In 1946, the National Planning Association published a study (Recovery in Europe by John Kenneth Galbraith) that alerted American public and private sector decision makers to the need to help rebuild war-torn Europe. Many of the ideas that were contained in the original Marshall Plan, which was started in 1948, can be found in this study. .
DC: Brookings Institute. Fine. 1992. First Printing. Trade. 343 pages; Fine condition. No creases. Solid, clean. This issue of the Brookings Papers on Economics Activity contains articles, reports, and discussions presented at the fifty-fourth conference in Washington D. C. On September 17 and 18, 1992. .
NJ: Prentice Hall. Good. 1969. First Edition; First Printing. Hardcover. 0136095119 . Ex-Library; 232 pages; Good/No Jacket. Book is solid - binding and hinges. Ex-Library of Standard Oil Company - reference library. One stamp on the title page, pocket inside back cover. Spine label. There was a Standard Oil Company label on the front cover, at the top edge, which came off - leaving a discoloration to the cloth. Flaps of the jacket are scotch taped inside front board. No other markings. Just a bit of shelf wear at spine tips and corner tips. This fascinating book provides a thorough exploration of the different economic accounting systems now in use throughout the world. .
Euromoney Publications. Very Good. 1998. Paperback. 1855646536 . 182 pages; Very Good condition. No creases. Soft bumps at corner tips. Just a bit of shelf rub at edges. Solid, clean. Trade Paperback. .
MA: Warren Gorham & Lamont. Near Fine with no dust jacket. 1997. Hardcover. 0791332268 . Near Fine/No Jacket. Outside page edges very, very lightly age tanning. Boards are straight, tips are pointed, spine is square and pages are clean. Pages are not sequentially numbered. Best guess over 1000 pages. Media mail only. Corporate Tax Digest - 3rd Edition - 1997. .
Brookings Institution Press. Fine. 1997. First Printing. Paperback. 0815710275 . 191 pages; Fine condition. No creases. Solid, clean. 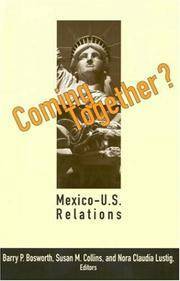 Scholars from the US and Mexico examine the major elements of the bilateral relationship. The economic dimension is moved to the foreground in two chapters that focus on NAFTA's effects on trade and financial transactions. Trade Paperback. .
Brookings Institution Press. Fine. 1997. First Printing. Paperback. 0815764251 . 214 pages; Fine condition. As New. No creases. Solid, clean. A proposal for remedies that would make a clearly broken system more rational and reshape the city-federal relationship, we think, for the better... it is worth a good an determined try - The Washington Post. Trade Paperback. .
NY: Alfred A. Knopf. Near Fine in Very Good dust jacket. 1979. First Edition; First Printing. Hardcover. 0394508009 . First Edition; 101 pages; Near Fine/Very Good. Outside page edges very lightly age tanning. Boards are straight, tips are pointed, spine is square, and pages are clean. DJ is very lightly age tanned. Has a few closed tears at the edges. Just a bit of shelf rub to back panel. Very nice in new protective sleeve. .
Teagle Foundation. Near Fine. 1995. Stapled wraps. 20 pages; Near Fine condition. Light Received stamp top corner of front cover. Solid, otherwise clean. The Teagle Foundation Incorporated - Fifty-first Annual Report June 1, 1994 - May 31, 1995 . Transaction Publishers. Fine. 1986. First Edition; First Printing. Paperback. 0887386652 . 184 pages; Fine condition. Solid, clean. A new president takes charge at the World Bank just as the institution is being thrust into an unprecedented, and potentially very powerful, global role. Trade Paperback. .
Frank Cass. Near Fine. 2003. Paperback. 170 pages; Near Fine condition. Soft bump top corner tips. No creases. Solid, clean. Some topics: Risk Reduction in Purchasing Organizational Professional Services; The Moderating Role of Confidence in Expectations and the Asymmetric Influence of Disconfirmation on Customer Satisfaction; The Impact of Chinese Culture on Service Predisposition; and, much more. .
AEI Press. Fine. 2004. First Printing. Paperback. 0844771716 . 69 pages; Fine condition. As New. No creases. Solid, clean. 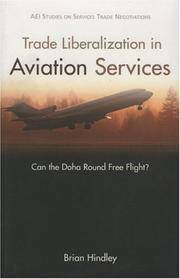 This book provides a strategy for liberalizing the aviation services industry. .
By Quelch, John A.; Buzzell, Robert D.; Salama, Eric R.
Addison-Wesley. Fine. 1991. Revised Edition. Paperback. 0201564009 . 422 pages; Fine condition. No creases. Solid, clean. Full of insights, analysis, and action recommendations that go way beyond anything yet published on the marketing effects of the EC 1992 program. Trade Paperback. .
Altamira-Rotopress. Very Good. 1973. Paperback. 132 pages; Very Good condition. Monthly magazine completely in SPANISH. No creases. Just a bit of shelf rub to covers. Solid, clean. Covers the Cultural, Politics and Economy in Span. Espana Hoy, Cultura, Politica Y Economia, Mayo / Junio, 1973 No. 33 & No. 34. .
Spain: Ateneo. Very Good+. 1964. Paperback. 31 pages; Very Good Plus condition. Text completely in SPANISH. June 18, 1964. Just a bit of shelf rub. Solid, clean. Coleccion: Ateneo. Lecture at the Ateneo Madrid on March 3, 1964 - El Fenomeno Del Turismo. .
India: J. N. Ghose & Sons. Good. 1984. Paperback. Unpaginated pages; Good condition. Back cover is torn at spine edge - almost off. Light stain top edge of front cover. Date stamp on front cover. Some marginalia and check marks. Economics Honours questions presented with answers. Each year is paged separately. .
CA: Hoover Institution Press. Fine. 1985. First Edition; First Printing. Paperback. 0817982221 . 134 pages; Fine condition. Full nmber sequence. No creases. First printing stated. Solid, clean. An excellent gift! Robert E. Hall is Professor at the Department of Economics and Senior Fellow at the Hoover Institution, Stanford University. He is engaged in research on inflation, unemployment, taxation, and monetary policy. Alvin Rabushka, a Senior Fellow at the Hoover Institution, specializes in taxation, the federal budgeet, and constitutional limitations on taxing and spending. In 'Flat Tax', they give us the fairest, simplest, most efficient, and workable plan yet proposed. Trade Paperback. .
MD: Adler & Adler. Very Good+. 1986. First Edition. Paperback. 0917561252 . 448 pages; Very Good Plus condition. Light front hinge crease. No spine creases. Inscribed by Janet Welch Brown. First edition stated. Just a bit of shelf rub to edges. Solid, clean. Political turmoil, food shortages, illegal migration: stories from Latin America are continually in the headlines, and the news they contain is usually bad. The authors state that these problems can be traced back to poor resource management. 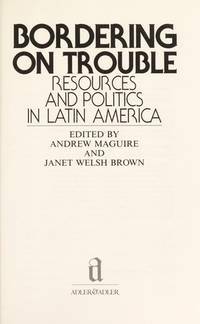 Governments, corporations, and citizens alike are misusing labor, natural resources, and investment capital in the countries of Latin America. And, in most cases, current U. S. Policy only encourages the chaos. Trade Paperback. ; Signed by Author . London: Edward Arnold. Very Good+. 1994. Second Edition; First Printing. Paperback. 0340595752 . 436 pages; Very Good Plus condition. The Geography of the World Economy: A Introduction to Economic Geography, Second Edition. Light front hinge crease - no spine creases. Just a bit of shelf rub and bump to edges. Solid, clean. Maps, charts, tables throughout. Oversized, sturdy trade paperback. The Geography of the World Economy provides an in-depth and stimulating introduction to the theory and practice of economic geography. In this revised and enlarged edition. Paul Knox and John Agnew offer new geograpical perspectives on the dynamics of local, regional and global economic organization over the long historical term. Trade Paperback. .